Management is the most challenging task in present business world. It needs certain skills to beat such challenge. Therefore every manager must possess essential skills for doing better management. These managing abilities are termed as managerial Skills. Managerial skills enable managers to maintain efficiency in the way how employers performing working tasks. Managers must have a skill to manage people and technology with the purpose of effective and efficient fulfilment of their tasks. Robert Kaz has classified three types of skills that are necessary for a successful management process such as technical, conceptual and human skills. Technical Skills: Technical skills must be possessed by managers to accomplish organizational tasks. These are not meant for working on machines, but can be used for sales and marketing. Basically, a technical skill is the capability to do assigned job. Technical skills assist the senior and middle level managers to use different machines and tools. It also helps them to use various procedures and techniques. The low-level managers must be proficient with such technical skills to give high performance because they must have to perform task in field. A technical skill is the aptitude in the performance of particular tasks, in particular skills involving methods, specialised techniques and equipment involved in specific functions, for example manufacturing and engineering. Technical skills also include specific knowledge, logical ability and the proficient use of tools and techniques to crack business issues (Samson, and Daft, 2003). Conceptual Skills: Conceptual skills are talent or understanding of managers for abstract thinking to assess whole situation and identify different states and to foresee the future state of the business. Conceptual skills is the ability of a manager to envisage the organisation as whole, distinguish interrelationships and be aware of how the organisation fits into the civilization, community and the world ( K.N. Bartol). Conceptual skills exploit the ability of a human to form concepts. Such skills include thinking creatively; formulating abstractions, analysing complex situations, and solving problems. Such skills assist management team to understand the major causes of the problems and not the symptoms. Mangers that have mastery over these skills are in a position to solve the problems and enhance productivity of organisation. It also helps the manager to establish goals for organisation and devise plan for every situation. Prof. Robert Katz describe that conceptual skills are needed by the senior management because they are involved in planning, organising and problem solving tasks. In the business filed, these skills are necessary for managements to operate business successfully. Conceptual skills are used in planning and dealing with ideas and abstractions. Such abilities enable manager to make good decision which is a characteristic of all managers (Katz, R. 1974). Human relation Skills: Understanding about human skills for managers to extract work from employees. The most significant role for managers is to effectively manage people in organization and to give best output. Human relations skills are also called Interpersonal skills. It is a capability to work with individuals. It assists the managers to comprehend, converse and work with others. It also helps the managers to lead, encourage and develop team strength. Human relations skills are necessary by all managers at all levels of management. All managers have to work together. These skills will allow managers to become leaders, to inspire employees to do best and complete task successfully. Some of human relation skills include Sensitivity to others, treating people fairly, Listening intently, Communicating warmth, Establishing rapport, Understanding human behaviour, Empathy, Tactfulness, Cooperative team member, Avoiding stereotyping people, Feeling comfortable with different kinds of people, Fun person to work with, Treating others as equals, Dealing effectively with conflict, Helping clarify misunderstandings, Creating an environment of social interaction. Besides above skills, managers must develop other skills for smooth management in organization. Communication Skills: Communication is an important process, which involves organising, selecting and transmitting symbols in correct way to ensure that listener perceives and recreates in his own mind the intended meaning of the communicator. Communication involves the initiation of meaning in the listener, the transmission of information and thousands of probable stimuli. Communication skills are congruently necessary at all levels of management. Managers must have capability to communicate the plans and policies to the workforce. Correspondingly, they must listen and solve the problems of the workers. They must promote a free-flow of communication in the organisation. Administrative Skills: Senior level executives must possess administrative skills. The top-level managers should recognize how to make plans and policies. They should also know how to complete work with in timeframe. They should be able to organize different activities of the organisation. They should also be able to control the all organisational functions. Leadership Skills: Leadership skill is the capability to influence human behaviour. A manager must develop leadership skills to stimulate the workers. These skills assist the Manager to guide workers and encourage them to do work in timely manner. Leadership is the ability to empower others to create new management or human systems to efficiently accomplish change through organizational goals and decision making. Max DePree stated that "leadership combines the unpredictability of the future with the gifts of individuals" (1992). The path for managers to embark upon to grow and develop leadership skills begins with the discussion and operationalization of these essential skills. Managers have the power to get things done within organizations, but this is not enough. DePree (1992) suggests that "good leadership includes teaching and learning, building relationships and influencing people, as opposed to exercising one's power". Problem Solving Skills: Problem solving skills are also known as Design skills. A manager must be proficient to identify a problem. He should also acquire an ability to explore the best solution for solving any particular problem. This requires intelligence, experience and up-to-date knowledge of the advanced technological developments. Six steps make up the problem solving process: Defining, Identifying, Understanding, Generating Solutions, Analysing, and Choosing. Decision Making Skills: Decision making skills are essential for business success. The quality of decisions determines project manager's capability and leader. Managers have to take many decisions frequently in organizational set up. Most of these decisions are unimportant and can be made using "common sense". However, some of these decisions have major impacts on the project, team members, or the business in general. For these cases, making a perceptive, gut feel decision can result in a poor choice with significant harmful consequences. To minimize negative consequences, decisions that are complex or have a high impact should be made using a systematic decision making model. Decision-making skills are also needed at all levels of management. Though the top-level of management take major decisions but middle and lower level executives must possess to take decision in critical business situations. A manager must have an ability to take quick and right decisions. He must also be able to execute his decision intelligently. The success or failure of a manager depends upon the precision of his decisions. Some of the factors that make a decision complex are several alternatives, significant uncertainties, multiple stakeholders, factors that make a decision high impact are financial Consequences, life-or-Death Consequences, Business Perception or Reputation. Improving skills in decision making will help managers to determine whether an intuitive or analytical approach should be used. When analysing managerial skills, Katz proposed that technical skills are less important as manager moves into higher levels of management. A first line manager is a manager at the lowest level of the organisation who manages the work of non-managerial employees and is directly involved with the production or establishment of the organisations products and services, and in addition responsible for the smooth daily operations in search of organisational goal (Bergman et al., 2006). While, human skills are needed in all hierarchical areas of an organisation, usually middle managers apply this skill in performing task. A middle manager is a personnel who works at the middle levels of the organisation and is accountable for the work of lower level managers. They are mainly responsible to implement overall organisational plans to accomplish organisational goal. They are expected to establish healthy relationships with workers in the organisation to support team work and resolve clashes (Samson, 2003). 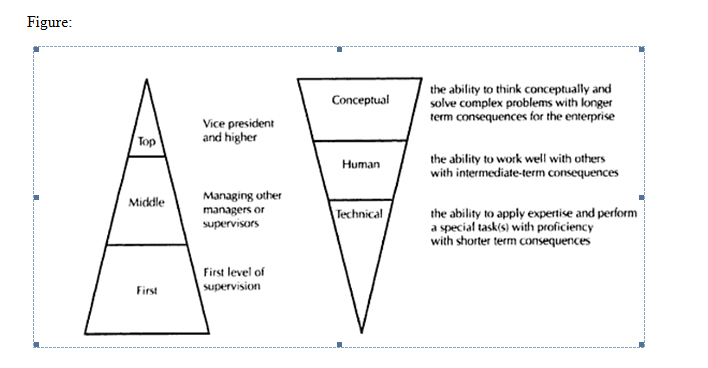 Katz proposed that conceptual skills are necessary for senior executives because upper level managers often deal with abstract ideas whereas lower level managers usually deal with recognizable objects and processes (Bergman et al., 2006). Top managers are in-charge for the entire organisation (Bergman et al., 2006). To summarize, basically successful management is dependent upon three basic skills. Technical skills must be possessed by manager to accomplish the mechanics of a particular job. Human skills; which are vital for working with others in order to be an effective group member and develop strong relationships among employees and to be able to build cooperative efforts among the team he/she leads. Conceptual skills, which are basic characteristics and enables managers to perceive the organisation as a whole and be able to make abstract decisions which in turn will result in the best outcome for the organisation and its employees (Katz, R. 1974). The relative importance of these skills seems to vary with different levels of managerial responsibility, nonetheless conceptual skills, coupled with technical skills, human skills and a sound knowledge base, are all crucial elements in organisational performance (Bartol, et,al., 2003).